When your little has a cow milk allergy, the doctor will walk you through management options. The first should should be for mom to eliminate dairy and for baby to keep breastfeeding. However, sometimes formula is necessary to supplement or replace breast milk. How can you tell the difference between various formula types if your little one needs a formula? Nutrition questions and navigating feeding options can overwhelm even the most seasoned parent. As a family living with food allergies, you know how quickly questions pile up regarding food and nutrition. Let’s take a look at the main types of infant formulas, and how they are different. We’ll also highlight which are options in the case of a cow milk allergy. Most infant formulas available in the grocery store are based on cow milk. That means they contain cow milk protein. It’s important to remember that protein is the part of food that triggers allergic reactions. Because these formulas contain whole protein from cow milk, they are not suitable for managing cow milk allergies. Milk protein is THE most common food allergen for infants and young children. For children with cow milk allergy, these formulas are just not an option. When avoiding cow milk proteins and dairy foods, many parents assume soy-based infant formulas are a suitable substitute. Soy formulas are based on soy instead of cow milk. That means they contain soy protein instead of cow milk protein. Companies market these formulas for patients with lactose intolerance and galactosemia, which are not common in infants. Experts now estimate that up to 60% of children with an allergy to cow milk are also allergic to soy protein. For this reason, expert groups in the US advise that infants with cow milk allergy not take a soy formula. The same recommendation is made by global allergy experts. Partially hydrolyzed formulas (pHF) – These formulas use protein that’s been broken down into smaller parts (these are called peptides). 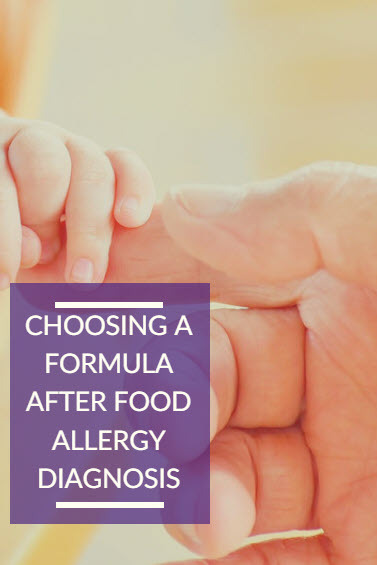 These formulas are not hypoallergenic and not suitable for children allergic to milk. You will not see the word “hypoallergenic” on the label. Extensively hydrolyzed formulas (eHF) – The protein in eHFs is in smaller pieces than pHFs. Most eHFs are hypoallergenic – check the label to be sure. However, studies have found that up to 10 to 40% of babies with cow milk allergy do not tolerate eHFs. That means their CMA symptoms will not full resolve. If you’re concerned that your little one isn’t tolerating an extensively hydrolyzed formula, ask your baby’s doctor about amino acid-based formulas like Neocate. Neocate is an amino acid-based formula, also known as an elemental formula. Amino acid-based formulas do not contain any intact protein or peptide chains. Instead, they contain the original building blocks of all proteins – amino acids. Amino acids are the most basic unit the body can use for protein, the easiest form to digest and absorb. Free amino acids cannot trigger an allergic reaction by the body’s immune system. They’re so small that the immune system can’t “see” them the way it sees proteins and peptides. Neocate offers the widest range of amino acid-based nutritional products for different age groups and conditions. Very sorry to hear that April! Definitely make sure that his healthcare team knows about his history of eventually not tolerating something that he'd been fine with, since that could signal a condition other than typical food allergies. We ask families that have any concerns to give us a call (800.365.7354) to let us know so that we can make note of this and capture relevant details. Duocal my son accidently received this at the hospital with his formula because milk lab wanted to make it 30 cal. He is allergic to milk soy beef nuts peanuts egg white egg yolk. Now he is allergic to this also. Not sure what ingrediant but i am going to have his allergist find out. He was allergic to keto diet then had a keti diet made feom microlipids oils fats aminoacid powder.tolerated for 30 days then vomitted for 21 days til they stopped that diet.. Was just letting you know . When does Neocate actually expire?